Recently the long-awaited 'Fifty Shades of Grey' movie opened at cinemas. When it was first announced that the books that became a phenomenon were to be made into a movie, there was much excited speculation on which actors would be cast in the two leading roles. The lucky lady to be cast as Anastasia Steele was Dakota Johnson, a decision which will surely make her a household name. Dakota herself comes from quite the acting pedigree - she's the daughter of Melanie Griffith and Don Johnson, and the granddaughter of iconic 'The Birds' actress Tippi Hedren. Dakota is a unisex name most commonly associated with the United States. It comes the Dakota people, a native American Indian tribe, and means 'ally'. The name has been given to multiple places in the United States, the most notable being the state names of North Dakota and South Dakota. Dakota has also been given to makes of aircraft, trucks, ships, a camera and even a cigarette brand; and in the musical world it is the name of more than one band plus the title of the 2005 hit by band Stereophonics. It's easy to understand why Dakota is used as a name for both genders. Pronounced dah-KOH-tah, each syllable starts with a harder sound more commonly associated with male names. However the softer emphasis on the first syllable and A ending are also popular among female names. And since currently two of the most notable famous bearers are Dakota Johnson and Dakota Fanning, many people probably think Dakota leans feminine. The history of the use of Dakota is a little more complicated than that though. Dakota first appeared on the US charts as a girl's name, given to more than five girls in 1915 and 1921. It appeared again for girls in the late 1950's and early 1960's, and it wasn't until then that it started charting for boys. The boys quickly claimed it and by 1993 Dakota had become a top 100 name for boys. When Dakota Johnson was born in 1989 the name was just outside the top 1000 for girls, so was a slightly offbeat choice for a girl. Then Dakota rose sharply (almost 500 places!) for girls in the following year. But it has only been recently that the number of female Dakota's born started to outnumber the males again. This seems to concur with popular opinion in other countries - Dakota is overwhelmingly feminine in the U.K and Australia. Whether you prefer it for a boy of a girl, Dakota has quite the quirky, indie-type charm to it. I've heard it labelled as a "bogan" name here in Australia, which I think is mainly because Australians see it as an American place name and not as a native, somewhat spiritual name. And maybe also because the work "daks" is slang for pants/underpants here. Alternative spellings are Dakotah and Dacoda. I personally have very mixed feelings about the use of Dacoda. Optimistically I hope its' use is because people want a "legitimate" way to use the spunky and friendly nickname Cody, and not just because they have lazy pronunciation. Then again, other would argue that it isn't a great name for a person - full stop - but it makes for a great dog name. I like to think that Dakota is a good example of a "modern" name that doesn't feel too over-used or tied to a particular year/decade. Good sibling choices include Levi, Indigo, Bodhi, Shiloh and Tru. What do you think - is Dakota boy or girl? And would you use it? No matter your opinion, I have a feeling we'll be seeing plenty more Dakota's in the next few years. Just a couple of updated posts I thought you might want to check out! First, we answer the question of what one family names a third sibling when their first two sons are named Cooper and Mason. Also, a few years ago I looked at the names of characters - better known as champions - from the online video game 'League of Legends'. They're constantly adding new playable characters so unfortunately my lists were a little outdated, but that has now been rectified. Some of my favourite additions to their legion of already cool and intriguing names are Braum and Zed for the guys and Kalista and Lissandra for the girls. See what you think - you can check put the full list of the Ladies here and the full list of Gents here. Has anyone else heard of these books? A friend of mine recently shared a link to this site - www.lostmy.name - on Facebook, so I checked it out and have to say that these books look fantastic! It's a personalised book for your child, but it's not one of those with a predetermined story that they simply insert a name into certain places. With these, your child's name IS the story! The concept is that your child has lost their name, and goes on an adventure to recapture the letters that spell their name. You can type in the name you want in the book into their website for a full preview too, so you know exactly what your child will be receiving before it is printed and sent to you. 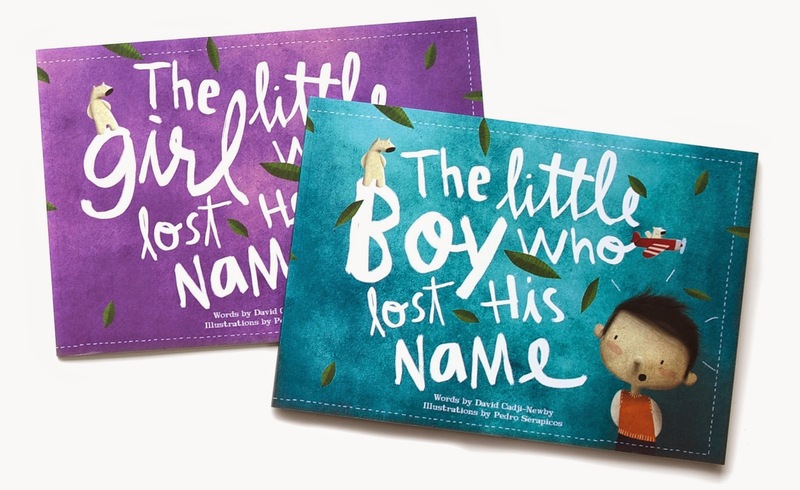 Most parents put a lot of thought into their child's name - so why wouldn't you want to celebrate it with them with a special book that they can keep forever?